There is so much to learn when it comes to natural hair. How to care for it, the dos and the don'ts, the language ... wait what? That's right there is a whole new language to learn as well. Starting my journey i was so lost when i saw conversations going on online between curly girls. What on earth is porosity? What does LOC mean? Well hopefully this A-Z can help with this. If i have missed any or you disagree with my explanation then please email me at candi_curls@outlook.com so i can edit these in. Apple cider vinegar is used to restore the hairs natural ph balance. It closes the hair cuticle making hair strands smoother and increasing the shine. Dilute this with water and apply to the hair, leave on for a few moments and then rinse with water. When deciding to "go natural", some women will make the decision to chop off the damaged or chemically treated hair, giving the hair a chance to start again. Hair breaking off or snapping due to being too dry and over manipulation. This is not to be confused with hair shedding. See my post on the difference between the two here. The name given when we use just conditioner alone to wash hair in between shampoo days. This lightly cleanses the hair and keeps it moisturised. This method is widely used by those following the curly girl method by Lorraine Masey which can be read about here. The hard feeling left on hair after using some hair gels and mousses. Hair feels crunchy. This is a thick hair mask which is left on the hair after shampoo is rinsed off, for anything between 5-30 minutes. This time allows the conditioner to penetrate the hair and nourish it, reversing any damage caused and getting it back to health. This is a hair dryer detachment loved by curly girls. It dries hair without any manipulation and due to its tiny holes, it allows even airflow drying hair roots as well as length. I use this one by Curlflo. Essential oils are oils from natural things such as plants and flowers and have healing qualities. These are great for scalp massages and are therapeutic. Using fingers instead of a comb to detangle the hair. This method is gentler especially for those who are head sore. This is my personal fave way to detangle my hair and my go to method. Read why here. Even if you don't know the actual name for this i guarantee you do it. Fluffing, is the motion of pushing your hair up with your hands from the roots and shaking it about. This causes the hair to have more volume and can also be done with an Afro comb or pick. Tracking your growth by using length check t-shirts, photographs etc is a perfect way to motivate yourself. You will see influencers and bloggers use this term alot, and it is the name given to a product which we can always rely on and always go back to, a favourite which never lets us down. This is a conditioner which is to be left in the hair instead of rinsed out. It acts like a primer to the hair giving it the moisture without build up. It is used underneath a cream or lotion usually. This is the order in which products are applied to the hair. and so on. Everyone has different orders in which they apply theirs. Finding out which way works for you is part of the journey. For me it is LCGO or LCO. Lotion or cream applied to combat dryness on the hair. This one i had no idea about before, but is quite simple. No poo, is the cleaning of hair without using shampoo. Co-washing is a no poo method, and again is something which those on the curly girl method chose to do. As shampoo can strip the hair, this method avoids that. The pineapple is a curly girl favourite style for sleeping, working out, or for everyday. It is when you use a hair tie to tie hair at the crown of your hair usually leaving hair falling down over the face or to the sides. I love this style for bed and for work. This is another funny strange word, but again is a simple one. This is just wrapping wet hair in a cotton t-shirt or microfibre towel to absorb excess moisture frizz free. I like doing this while i continue to get ready in the mornings as it speeds up drying time. My towels of choice are Only curls London or Happy Hair Box. You will see everyone talking about what porosity they are. 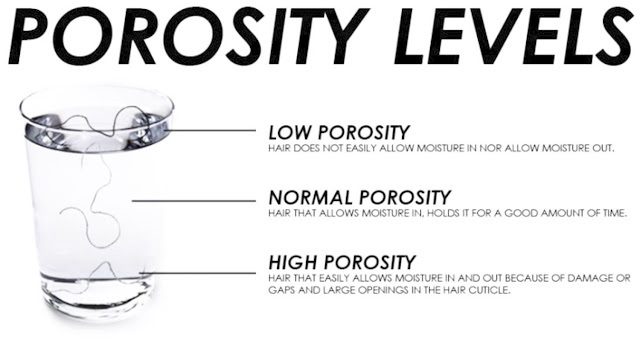 Porosity is just how easily your hair absorbs moisture and there is a simple way of testing yours. Take a strand of hair and drop it in a glass of water, where does it float? This is the method of applying product onto the hair by clasping hands around the hair and pulling it downwards. Our hands are in a "prayer" position, and this is where it gets its name from. This method means that hair gets an even coat and curls are not manipulated. To protect your hair better when shampooing, it is beneficial to add oils to maintain the moisture better and stop it being stripped too much. This is a pre-poo. Hairstyles which protect our hair. Some like to use braids and weaves in summer to protect their hair from harsh heat and drying out. Ends are tucked away and hidden and hair can flourish underneath these styles. Braids and buns are also classed as protective styles. This is a hair treatment designed to restore protein lost by chemicals, manipulation and ageing. Some people have different levels of protein sensitivity and so not everyone does these treatments. If you use chemicals such as bleach on your hair then a protein treatment is great for repairing damage. Similar to fluffing, except this time from the ends upwards. 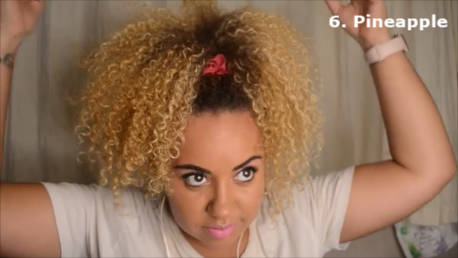 This is a great way of creating curls when hair is soaked with product. It is also a good way to get rid of any crunch left over by hair gel and mouse. Scrunch out the crunch (SOTC) is the name for this. Silicone's are conditioning agents found in household cleaning items. They are added to hair products to add shine and slip, but also have side affects. They can cause a film over the hair cuticles and build up which will need to be removed with a clarifying shampoo, so if you are a no-poo girl, it means breaking your methods. Most curly girls will opt for products with none of these in to avoid this build up. This is every girls enemy. This is our hair reacting to moisture after wash day. We lose a few inches as hair bounces up and the length is hidden. 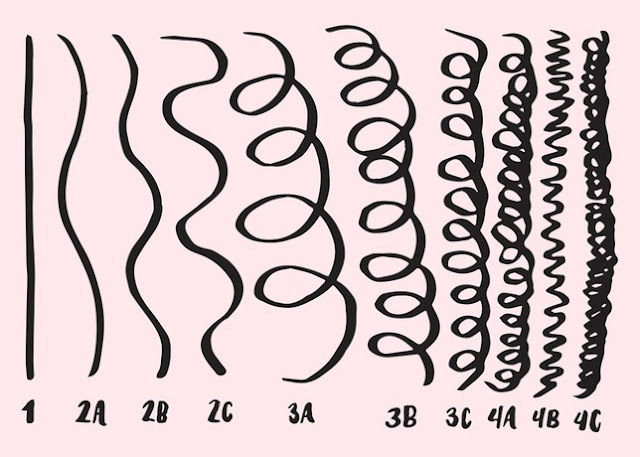 Where we may all hate shrinkage, it is actually a really good thing as this bouncing up of hair when it is dry, means that your hair is actually really healthy. If hair doesn't bounce back up then it needs some TLC. Try not to focus on the negative on this one and enjoy the spring back. The spelling is different depending on where in the world you live, but this is another chemical in hair products which a lot of curly girls will try to avoid. Sulfates are found in dish soap and strip everything from our hair leaving it dried out and straw like. These chemicals overtime break down the hair shaft and can leave salt residue on the hair. Those not brave enough to big chop, will often go through transition instead. This is the process of going natural and growing out the chemically treated or damaged hair slowly over time. Taking two strands of hair and intertwining them like a rope. This method is great for keeping sections separate while deep conditioning, and is also a great protective style or way of training your curls when transitioning. I use this method in all of my deep conditioning to keep sections tangle free while my treatment works. Exactly what it says, wash & go. This is washing and styling hair and then allowing it to dry.